With Pakistan’s film industry taking a U-turn, the latest addition to revive the cinema is the Pakistan’s first ever science fiction film “Nation Awakes” by Aamir Sajjad. “We have constructed the story so that it focuses on the life of a superhero from the time he is with his foster parents; we won’t go into the details of where he comes from or his background. 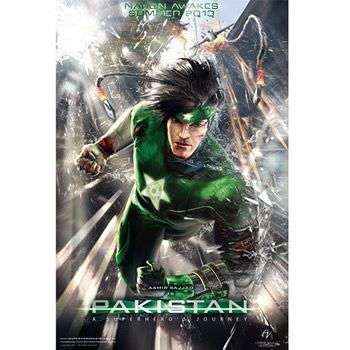 Since the comic culture is so limited here in Pakistan, we figured it would be more logical to make a film first as compared to a graphic novel,” says Aamir. 80% scripting of “Nation Awakes” is completed, the film’s casting will begin in april 2013 and the teaser to be released in June. Music director for the film is Sahir Ali Bagga, Song Lyrics are done by Sabir Zafar & Riaz Ur Rehman Sagar and the singer is Sara Raza Khan.